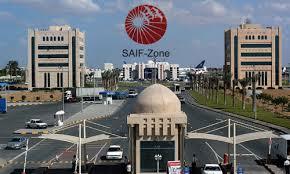 The Sharjah Airport International Free Zone, SAIF Zone, has recently participated in a business event entitled, ‘International Business Forum – Expanding Business Globally’, which was organised by the Board of Investment of Sri Lanka, BoI, and Federation of Chambers of Commerce and Industry of Sri Lanka, FCCISL, in Colombo. Speaking at the forum, Saud Salim Al Mazrouei, Director of SAIF Zone and Hamriyah Free Zone Authority, HFZA, said that SAIF Zone is offering many opportunities for entrepreneurs and investors from Sri Lanka and the increasing pace of trade between the UAE and Sri Lanka is a positive sign of rapid growth at all levels. “We are interested in Sri Lanka’s trade sector and we also want to open doors to Small Medium Enterprises, SMEs, for entrepreneurs from Sri Lanka. A number of Sri Lankan companies are keen to set up their businesses in the Sharjah’s free zones, hopefully by 2017,” he added. Al Mazrouei emphasised the importance of enhancing economic and commercial cooperation between the Board of Investment of Sri Lanka and SAIF Zone.